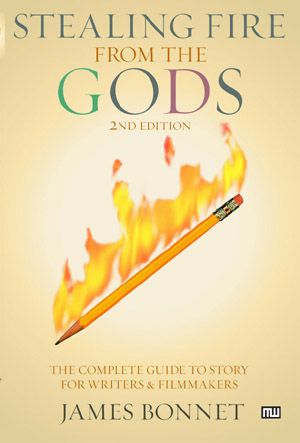 Considered by many top professionals to be the most definitive and comprehensive guide to all things related to story and storymaking, this expanded, completely revised and long awaited second edition of Stealing Fire from the Gods, The Complete Guide to Story for Writers and Filmmakers, incorporates many of the advances evolved in James Bonnet’s professional workshops over the last seven years. These include new revelations concerning the essence of story (that without which there would be no story), the high concept great idea, the structures of the whole story passage, the anti-hero’s journey, the threat (the cause of the problem), the value being pursued, the ultimate source of unity, and the use of the quintessential to make your characters not only memorable and merchandisable but truly charismatic. It also contains a critical assessment of the three act structure, many new and completely revised illustrations, and the analyses of many important new stories and successful films. Buy a signed copy from the author. James Bonnet will give you the principles and tools you need to create motion pictures and novels that are packed with emotion – box office hits and best sellers that will resonate for generations. How to emulate the natural storymaking process and put all your conscious and unconscious creativity into your work. The nature and purpose of story, the compass that will orient you toward the real needs and desires of the audience. How to use your storymaking to dramatically transform your own and other people’s lives. Because it contains important new knowledge about story that is not available anywhere else and is relevant no matter what kind of story, true or fiction, you want to create for whatever medium, this book will not only be of interest to writers and filmmakers, but to anyone whose livelihood depends on an understanding of what makes a story great or successful. Its special emphasis is on how the great myths and legends were really created and how contemporary stories with that kind of magic and power can be created again. Armed with this new, deeper understanding of story, there is no limit to the power and art that can be created through them. You will know how to tap powerful creative sources deep within yourself and have the tools to use modern metaphors to create powerful and entertaining stories that have a significant impact on the world. Stealing Fire from the Gods will also be of interest to psychologists and mythologists. Some important new discoveries have been made in their fields, most notably concerning the new phenomena revealed by the cracking of story’s symbolic code. The secrets of great stories, it turns out, are the secrets of the human mind. And the study of story is the study of this remarkable phenomenon. Every great story reveals some small piece of that magnificent mystery. Unlocking the secrets of story unlocks the secrets of the mind and awakens the power of story within you. Work with that power and you can steal fire from the gods. Master that power and you can create stories that will live forever. Darryl M. Diamond, M.D., Ph.D.